Office and residential buildings use more energy per square metre, the taller they are, according to new research from UCL. 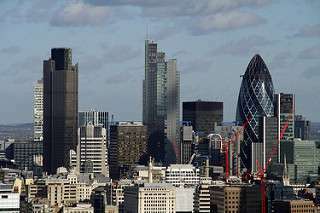 Researchers at UCL's Energy Institute have found that electricity use, per square metre of floor area, is nearly two and a half times greater in high-rise office buildings of 20 or more storeys than in low-rise buildings of 6 storeys or less. Gas use also increases with height, by around 40%. As a result, total carbon emissions from gas and electricity from high-rise buildings are twice as high as in low-rise. The 'High-Rise Buildings: Energy and Density' project, funded by the Engineering and Physical Sciences Research Council (EPSRC) analysed data from 610 office buildings in the UK. The research team looked at energy consumption 'in operation' and not 'embodied energy' (energy used to produce building materials and in the construction process). Professor Philip Steadman (UCL Bartlett School of Energy, Environment and Resources) explained, "The use of air conditioning plays a part in but does not provide a complete explanation of these results. On average, carbon emissions from air-conditioned offices are found to be 60% higher than those from offices with natural or mechanical ventilation. "It is not the case, however, that the high-rise buildings in the sample are air-conditioned and the low-rise are not. The sample includes buildings of both types, of all heights. The increase in emissions with height is seen in buildings with and without air conditioning." The research team also looked at all residential buildings in twelve London boroughs and found that gas use increased substantially with height, while electricity use also increased but less sharply. The analysis was made by taking census districts in the capital, and comparing total gas and electricity use in each district with the total heights of all houses and flats added together, along with their volumes, footprint areas, and other building and population aspects. Professor Steadman added, "We suspect that the reasons for our findings are connected with the physical and meteorological consequences of building higher. Air temperature decreases with height, and average wind speed increases. Taller buildings that stand up above their neighbours are more exposed to these strong winds, as well as to more hours of direct sun. Thus energy use for heating and cooling would both be increased. But these hypotheses have yet to be tested." A third part of the study looked at the relationship of different forms of building to their densities, where density is measured by taking the total floor area and dividing by the site area. The work has shown that, in many circumstances, the densities achieved by tall towers can be achieved with lower-rise slab or courtyard buildings. It is not always necessary to build tall to achieve high densities and energy use could, in many cases, be greatly reduced by building in different forms on fewer storeys.